Phenom Pro is the modern backbone of talent acquisition, empowering recruiters to effectively source candidates, nurture their pipeline and make smarter, data-driven decisions. Transform Career Site visitors into viable leads in your pipeline. Track job seeker activity to target messaging based on interests. All the data you need to make better talent decisions. Build a database full of talented professionals using the Candidate Pipeline tool. Capture every touch point in the Candidate Pipeline activity feed to truely understand what jobs and content your prospects are interested in. "The Phenom People Platform provides us with the insights we need to accurately measure and optimize our talent acquisition resources." Clicked on Job ”Senior UX Designer"
Applied to Job "Senior UX Designer"
With PRO, you recruit like a Marketer. 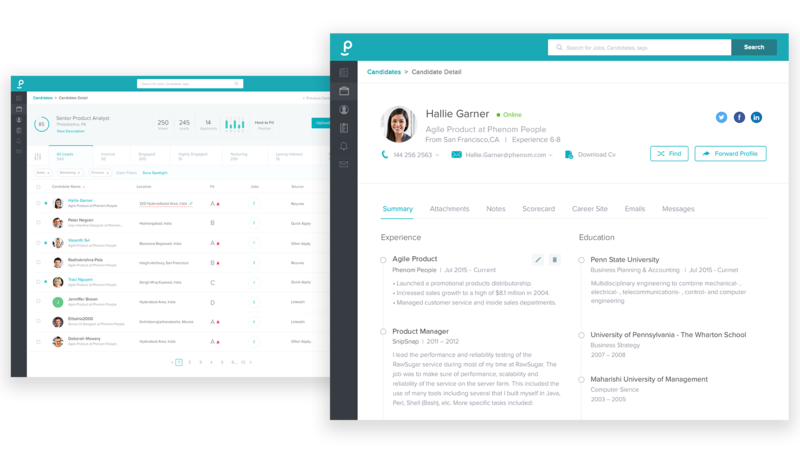 Phenom Pro makes software for the modern-day recruiter. We provide all of the necessary tools to evolve your recruiting processes into a talent converting machine. We’ve built our software around a proven pipeline management methodology. Have a clear visual interface that prompts you to take action, remain organized and stay in control of a complex hiring process. Organize dynamic candidate lists and trigger automated drip campaigns to strategically keep them engaged throughout the recruitment process. Nurture your pipeline with fully personalized jobs and content catered specifically to them. Use advanced talent filters to organize custom groups of candidates. Build dynamic lists that auto-add candidates matching specific criteria. Drag and drop your way to engaging emails using the easy template builder. Schedule and trigger an automated series of personalized emails. Leverage real-time insights on job seekers, traffic channels, hiring initiatives, marketing campaigns, and more to help identify recruiting bottlenecks and capitalize on talent opportunities.